As you know, I have been sick on/off since December and the stress on my immune system has really been taking its toll on me. I was already taking a number of supplements (fish oils, probiotics, vitamin C, oil of oregano), but recently went to a naturopath to discuss additional options for boosting my overall health. My daily pill intake has now increased considerably but I'm finally feeling more like myself. Of course, time will tell whether my new regime is really having a positive effect rather than placebo but after months of illness let's just say I was getting pretty desperate for any solution possible. That brings me to today's post, which is a little different because I'm going to be talking about supplements. However, they're beauty-related so still totally relevant for the blog! A while back, I was contacted by PR for NeoCell to try out some products for the company's recent launch in Canada. Initially I was a bit skeptical because the idea of taking collagen supplements sounded really weird. However. since I've been focusing on improving my overall health and well-being, I decided to give it a try. NeoCell's collagen products are specifically designed to support the body's natural collagen supply, helping skin achieve that healthy glow, hair grow thicker and shinier, and nails longer and stronger. As we age (something I'm all too familiar with given my impending 30th birthday later this year -- eep! ), collagen also plays an important role in strengthening and rebuilding lost muscle mass and connective tissue. 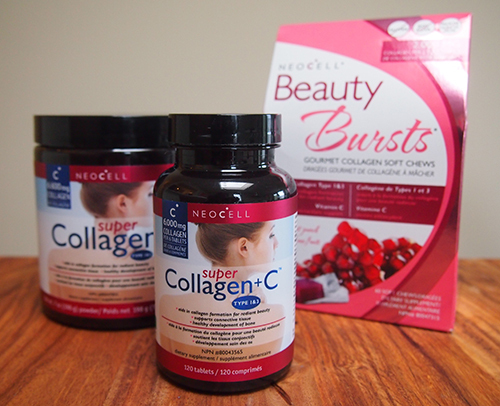 If you're interested in trying collagen supplements for yourself, here are a number of easy to digest options: NeoCell Super Collagen+C Tablets, NeoCell Super Collagen Powder, and NeoCell Beauty Bursts™. 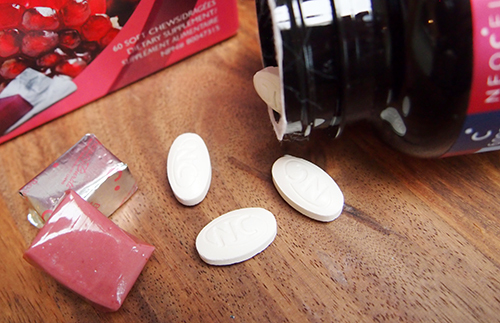 For those who are okay with taking pills, the NeoCell Super Collagen+C Tablets are standard oval tablets that deliver 6,000 mg of NeoCell collagen. If pills are tough to swallow, you can instead try a scoop of NeoCell Super Collagen Powder mixed in with water or juice. I personally don't like drinking my supplements so this is my least preferred method. Instead, I have been loving the yummy NeoCell Beauty Bursts™. These fruit chews aren't candy but they do taste pretty good (if a little chalky) and contain 2,000 mg of collagen, along with hyaluronic acid and vitamin C. Talk about an easy way to pack some important nutrients into your diet! NeoCell products are all-natural and contain no preservatives, artificial flavors or colors, and contain no gluten or GMO ingredients. Find them at Whole Foods Choices Markets, and London Drugs. P.S. I'm off to Chicago for a week-long vacation so I'll be taking a mini hiatus from the blog. When I return, prepare to be bombarded with photos from my trip! i really wanna try something similar to this, they sound great! Have fun!